Urgh, I look at this photo and want to cry. How revolting. What’s worse is that this was the best one taken – so you can only imagine how bad the other ones were. 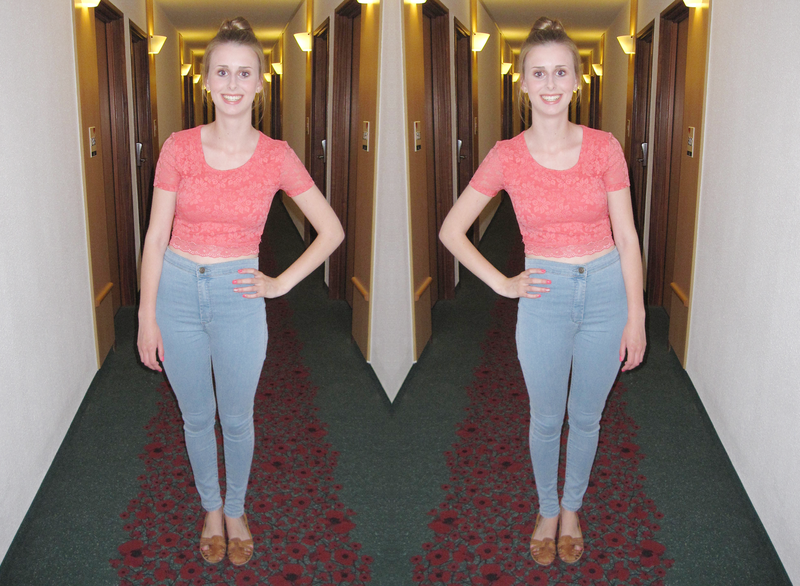 This was what I wore on Thursday night in Nottingham, we went for a meal in TGI Fridays, or as my parents call it – TIGF. It was a challenge trying to teach them that it’s Thank God It’s Friday therefore ‘TGIF’. Anyway, I absolutely love this crop top mum got me for my birthday, it’s coral – my favourite colour. It’s just so pretty!! I couldn’t be bothered to get too dressed up seeing as TGIF is a much more relaxed restaurant so opted for the Joni’s and sandals.